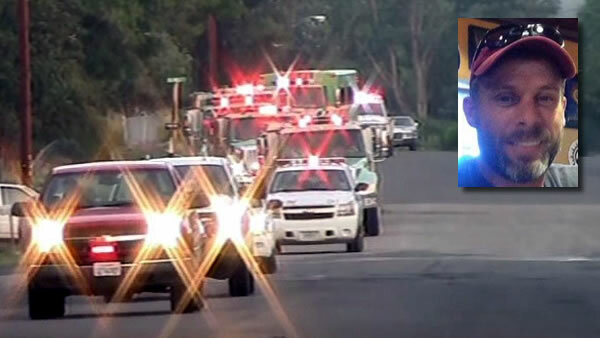 ALTURAS, Calif. (KGO) -- A firefighter who died in the line of duty last week was honored Monday during a procession. Cars drove out of Alturas into Smoky Mountains toward Mount Shasta. Gov. Jerry Brown has ordered flags to be flown at half-staff in the capitol and elsewhere around the state after a firefighter named David Ruhl died battling the Frog Fire in the Modoc National Forest outside Alturas. David Ruhl was reported missing last Thursday while fighting the Frog Fire in the Modoc National Forest and his body was discovered Friday morning. An autopsy is scheduled for next week to determine how he died.